Departure from Resolute and Intrepid, 1853. Ultimately, the disappearance of Franklin`s Arctic Expedition sparked one of the most extensive search efforts in world history. According to historian W. Gillies Ross, 32 expeditions were engaged in the search for Franklin between 1847 and 1859. Twenty of these were actual search parties, 11 were supply expeditions, and another was a relief expedition sent to search for the searchers. In the process, many more sailors were injured or died in their notable efforts to bring closure to the Franklin Mystery. Was it all a waste of effort and lives or was there a long term significance to this massive commitment? Look for evidence to answer this question in the Ripples and Ice Jams section. As you will also learn in this part of the site, Inuit played a major, indispensable role in several of the most important search parties. Testimony by Inuit witnesses revealed brief encounters with European men who were probably members of Franklin`s expedition party or told of abandoned ships they had seen in the icy bays and channels of the Arctic archipelago. 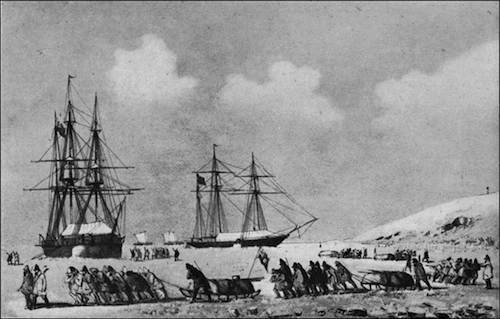 Lacking knowledge of the circumstances of the Franklin Expedition, Inuit were not engaged in rescue efforts but they astutely saw in the abandoned ships and camps the potential for finding useful materials such as wooden and metal objects that could be used to make or refashion weapons and other material objects.